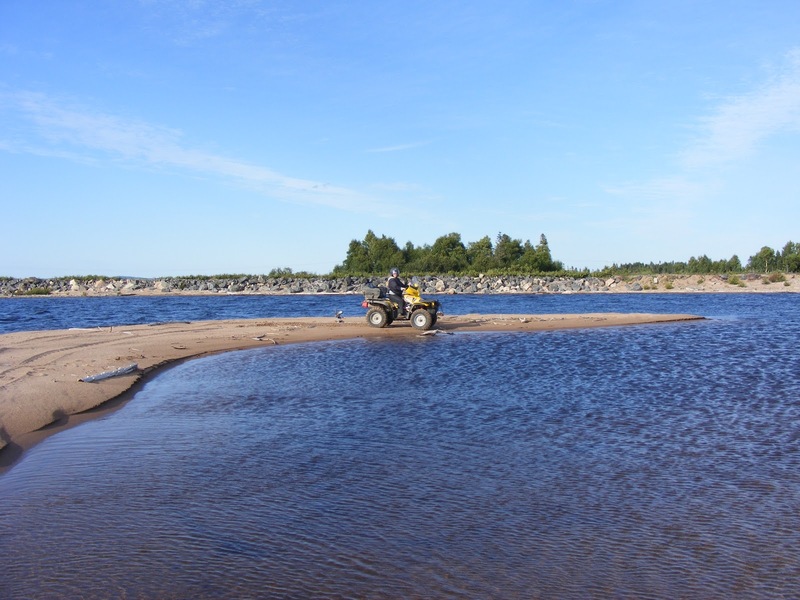 So you want to cross Newfoundland by ATV and you don't want to hire a tour guide. You've come to the right place. I've put together a step by step quick guide for you to follow for the Argentia to Port Aux Basques run. Total cost is about $1,500 for everything - tickets, food, alcohol, motels, gas etc. That price is for one person splitting accommodations with another person along the way. Step 1 - Pick the time of year and the friends you want to bring along. I suggest July 1 to September 15 for optimum weather. The bugs aren't bad in July believe it or not and there seems to be less people on the trail then. Step 2 - Book your ferry tickets online with Marine Atlantic several months in advance. I typically have my ferry tickets and hotel rooms booked by February. Get a room on the ferry for sleeping, trust me, especially the Argentia Ferry. No more than two adults to a room otherwise they are too crowded. You could put three in a room in a pinch but definitely not 4 grown men. You'll have no space left. The ferry crossing is probably the single most expensive part of your trip at about $512.00 per adult. That includes the cost of your ticket, your ATV, and bunk rooms both ways. You can save money by not booking rooms, but I highly advise against that. You won't get a good night sleep and you don't want to start the trip sore and tired. The Nova Scotia to Argentia ferry leaves every Sunday, Wednesday and Friday at 17:30. Be there about three hours early. You'll need time to unload your ATV's and then you'll have to park your cars across the street and go back to the terminal. The Port Aux Basques to Nova Scotia Ferry leaves NS every day at 11:45 a.m. and 23:45 and 06:30 on Wednesday only between late June and September. Check their website in case times change. Night 1 Clarenville - St. Jude's Hotel. Night 6 - you'll be on the ferry. Each of the above motels is easy to find. Trailblazer's, and the Driftwood Inn are visible from the trail. The other's have marked trails to the motels and are only a short distance from the main trail with the exception of the Comfort Inn in Gander. You need to ride through town to get to it but it is an ATV friendly town. The police won't bother you if you ride responsibly. Step 4 - Detailed planning. 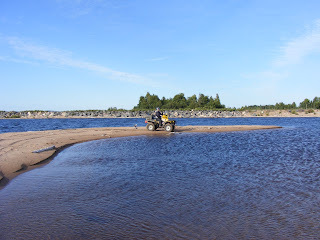 Read my Planning your Newfoundland ATV Trip page for all details you need to know - like where do you park your truck before taking your ATV on the Ferry, where does the trail actually start when we get off the ferry, GPS tracks etc. Read and print my Daily Details page if you are heading from Argentia to Port Aux Basque. It tells you things you need to know each day of that trip. Step 5 - Review my packing tips page for ideas on what you need to bring. The list is big but you can adjust it for your own needs. You won't need much if you're staying at motels and you'll need more if you want to do some camping. Be sure to bring a tire patch kit (plugs) and an air compressor and goggles to protect your eyes from dust if you have an open helmet. A dust mask is important if you have an open helmet. If you don't find everything you're looking for feel free to email me at patrickryan57@hotmail.com and I'll answer your questions. It's no problem, I do it all the time. Don't forget to take a look at the pictures from the 2013 trip as it was this exact route. You'll be able to see what the trail looks like with pictures and videos. Wow! Someone just suggested to me to cross the T'Railway on an extended snowmobile trek so I plunked it into my search engine and immediately came across your blog. Fan!Tastic! Pretty thorough and definitely can be crossed with a snow trek! Thanks for all the info! Hey thanks! Glad you liked it. I hope you make the journey! This is such a great resource, we are going to do this trip next August for our honeymoon , we are probably going to try to rent a UTV, do you know of any businesses at either end that rent them and let you drop at one end ? Hi there. Unfortunately I don't know of any companies that are currently renting ATV's or UTV's. There used to be a company in Cape Breton that rented them but not any more. If I find one I'll post it. That's good to know thank you. Too bad they are in Deer Lake. I wish I knew of someone that rented them in Sydney, NS so people could get the machines before they get on the ferry. That would be perfect. Hi Patrick. I was in contact with you and three of us completed the trip in October of 2015. Weather was great and the colors of the trees was fantastic. We went from Port-Aux-Basques east...and using your blog made it simple to plan. I really appreciate the time and the information included. Really great for anyone not familiar with Newfoundland weather...lol. If anyone has any question please feel free to contact. Oh...they closed the bridge in Terra Nova 3 weeks after we went through and the bridge was questionable when we crossed. All the best to everyone who makes the treck...it is wonderful. Yes. The information you are looking for is on the Planning Your Trip page. Cecil Anderson can truck you around Corner Brook. His number is on that page. I have a company called Shudamunks Adventure Tours. We do guided trips to the interior of Newfoundland.You can check us out at www.shudamunksadventures.ca. Excellent information in this blog. You should also mention that a $50 donation per ATV is now asked for to try and maintain the trailway. If people don't help out it will eventually disappear as a trail as it is deteriorating faster than ever. Bridges are being condemned, etc. Please donate, it's only a small amount. I have been busy planning and booking a trip for this september. I have planned everything using your day by day guide. Thank you for making it so easy . I'm glad you found it useful. I hope you have a fantastic time! I'm going in September too. Maybe I'll see you there. Yes you do. Check out the Planning Your Trip Page. I have everything you need to know there.